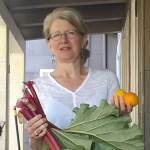 My favorite anytime-of-the-year color combination is red and orange, the colors that come to life when you join persimmon with pomegranate, cranberry with orange, kumquat with rhubarb, cherry with apricot, watermelon with cantaloupe, or peach with plum. 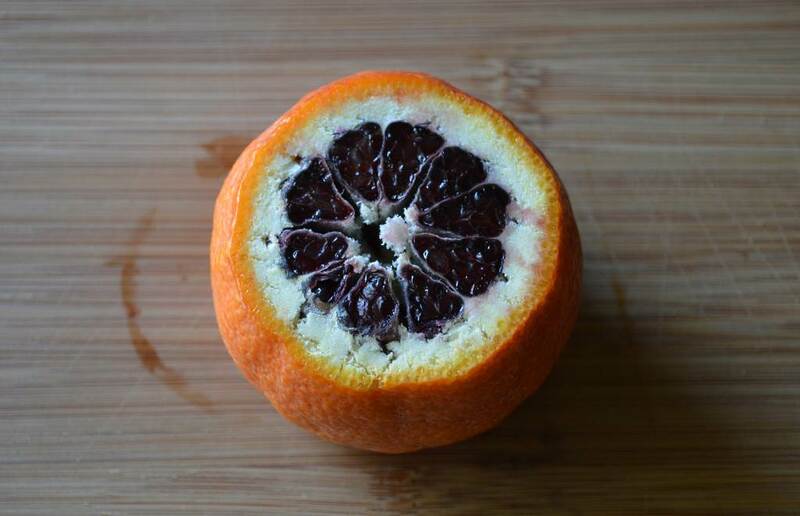 Standing alone in a single fruit is the best mix of all, the vibrant orange and dark red of blood oranges, unpredictably beautiful because you never know how the colors have combined in any given orange until you cut it open. 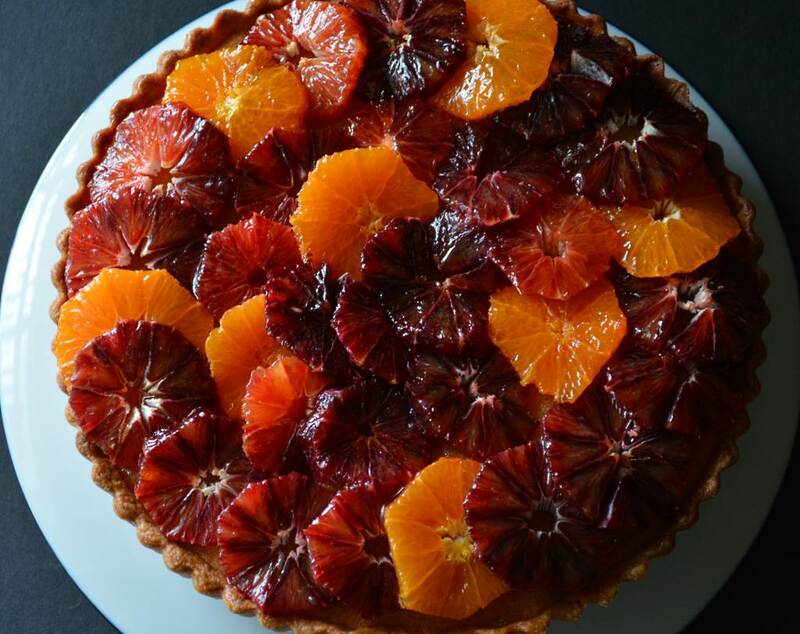 I happened to be making this blood orange tart for Oscar night, and as we were swooning over the colorful gowns being shown off by gorgeously made up actresses, my husband called out, “You should name that tart after the painted ladies of Hollywood!” I couldn’t resist. Once you have your Sweet Tart Dough shell baked (I like to have a frozen tart shell in the freezer at all times. When the mood strikes, I can take it out and bake it without thawing. A real time saver!) 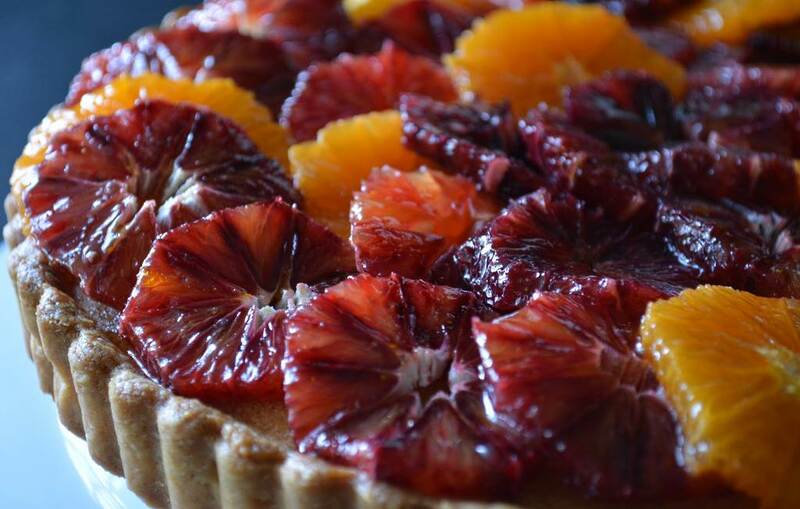 The filling goes together quickly, and paring and slicing the oranges is a snap once you get into the rhythm. If you don’t have a Microplane grater, I highly suggest you get one. 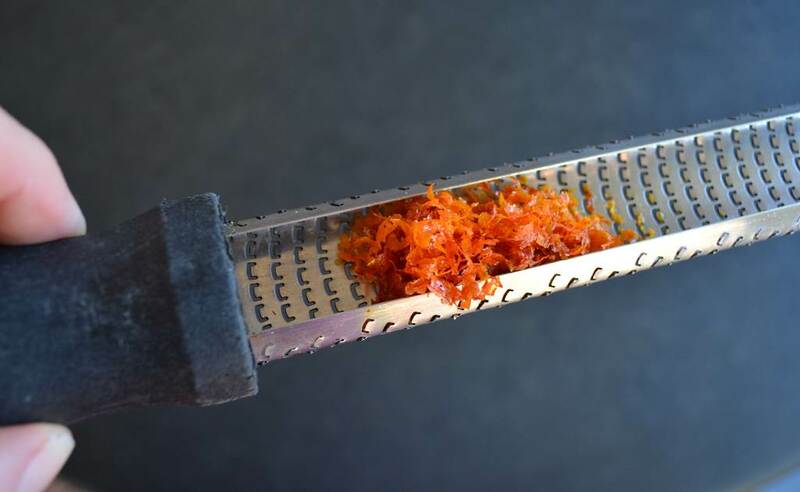 They make short work of zesting citrus, and grating nutmeg and fresh ginger. When zesting citrus I like to turn the Microplane upside down and draw it across the fruit towards me. The zest collects in the groove of the tool so you don’t need a bowl underneath to catch it. 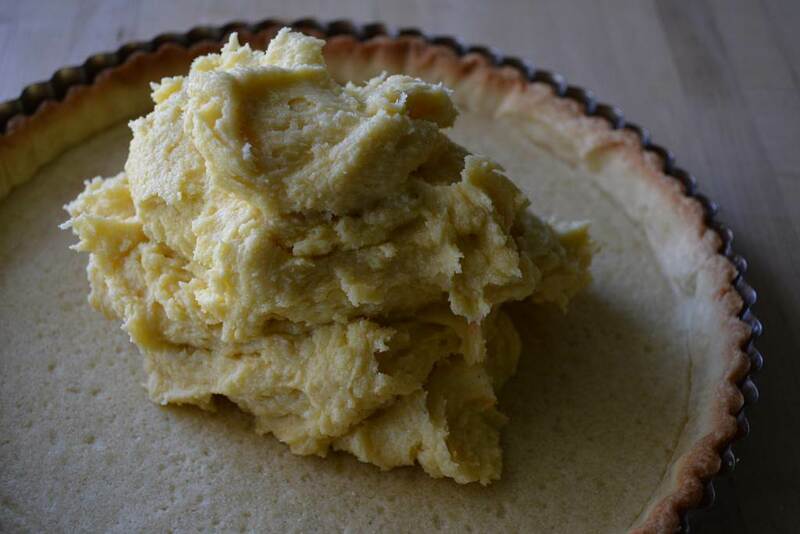 Make sure you combine the almond paste, butter, and sugar before you add the eggs. Once the eggs go in it is very difficult to beat any lumps out. 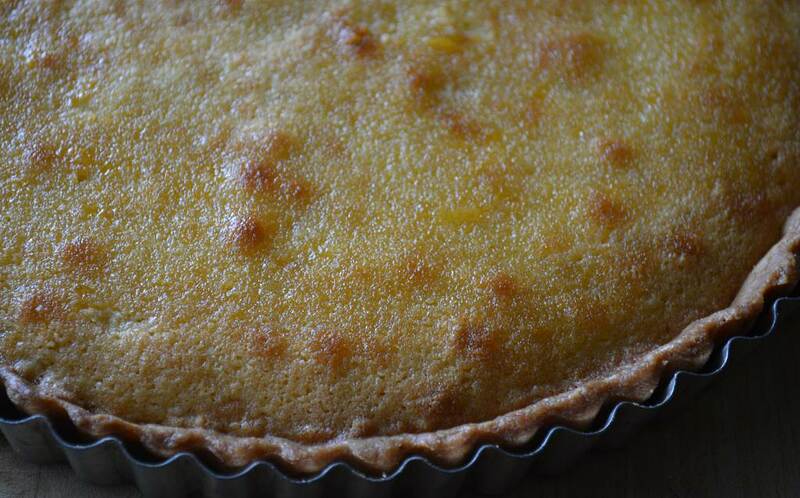 A toothpick inserted into the center of the tart will come out clean. Gently paint the soaking syrup over the baked filling. This moistens the tart and adds more orange flavor. Cut the top and bottom from the oranges, and stand upright on a cutting board. 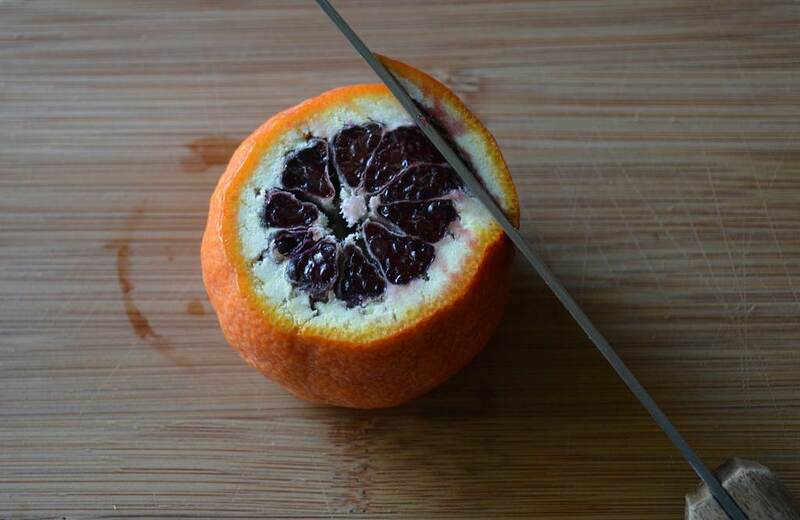 Using a sharp knife, carefully cut the rind away from the fruit being careful to remove all of the white pith. 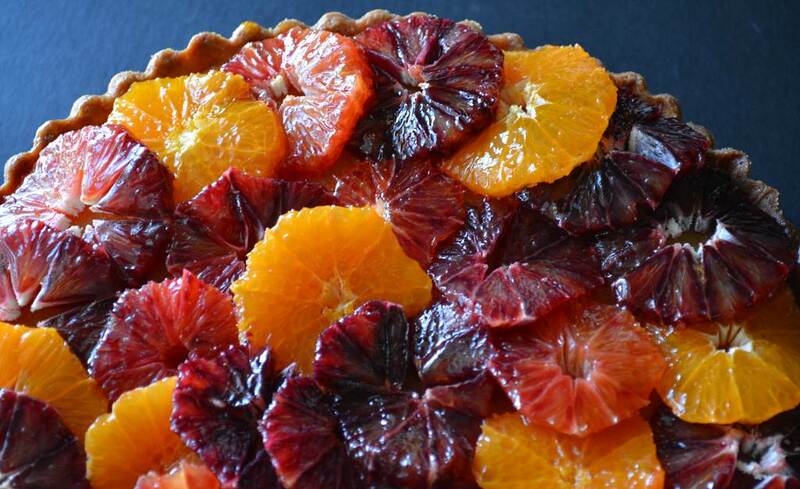 Arrange the orange slices in slightly overlapping concentric circles on top of the filling. Break up the almond paste and place in the bowl of an electric mixer. Add the butter and sugar. Using the paddle attachment, beat on medium high until the mixture is light and creamy. Add the eggs one at a time, beating well after each addition. 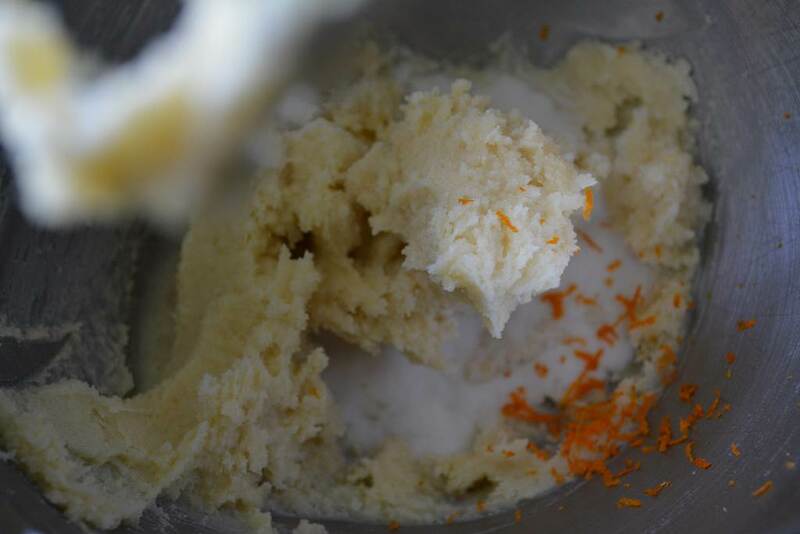 Add the orange zest, vanilla extract, almond extract and salt, and mix to combine. Remove the mixing bowl from the machine and gently, but efficiently, fold in the flour. Scrape the almond mixture into the prebaked tart shell. Spread the filling evenly and bake for 25 minutes, or until the filling is golden brown and a toothpick inserted into the middle of the tart comes out clean. 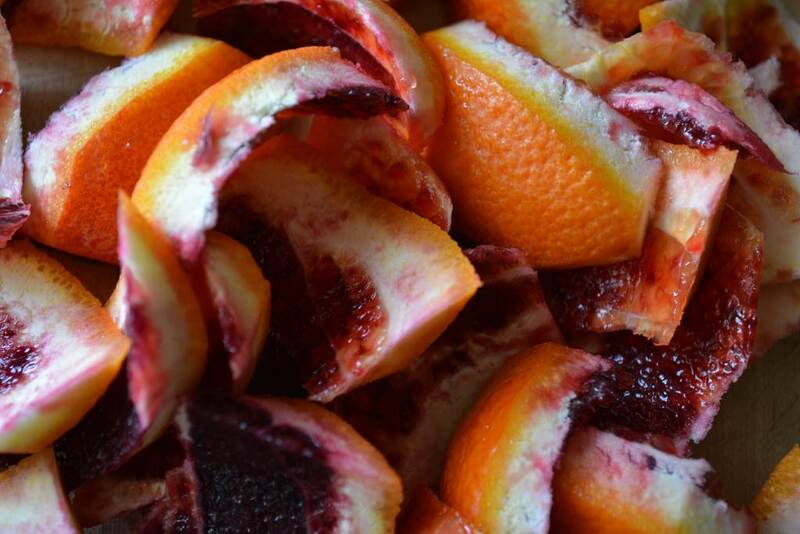 Meanwhile, make the soaking syrup by combining the juice of 2 of the blood oranges with ¼ cup sugar. Prick the surface of the baked almond filling with a toothpick. Gently brush the surface of the filling with the syrup. You will have leftover syrup which you will make into glaze. 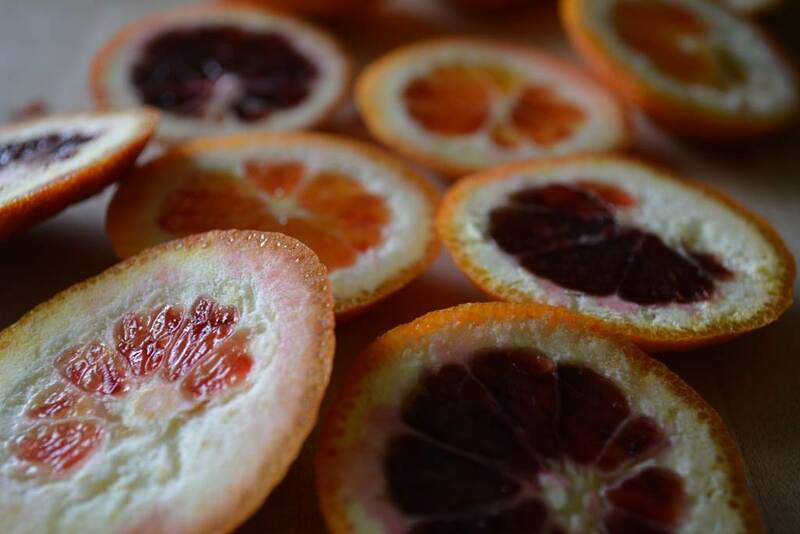 Cut the top and bottom off the remaining blood oranges. Using a very sharp knife, cut away the rind in strips, leaving no pith behind, and taking away as little fruit as possible. Turn the orange on its side and cut into slices resembling pinwheels. 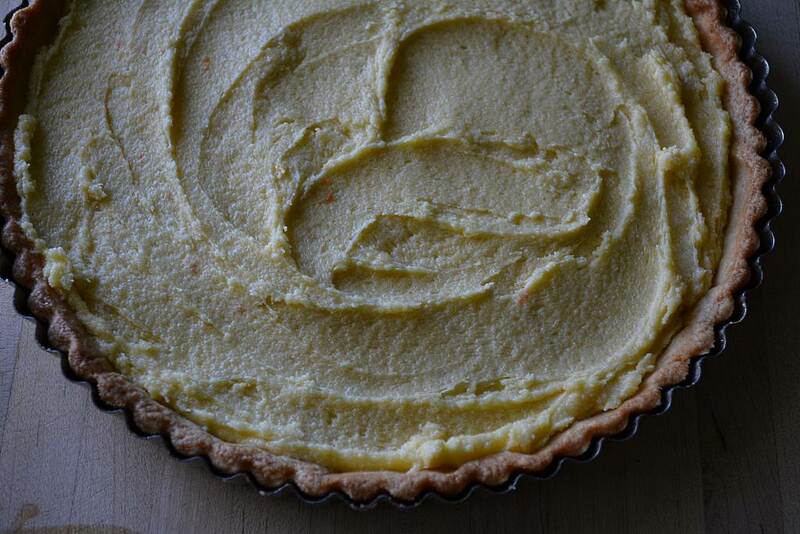 Place the slices on top of the tart in overlapping concentric circles. Transfer the remaining soaking syrup to a small saucepan and simmer over medium heat until it reduces and thickens a little to make a glaze. 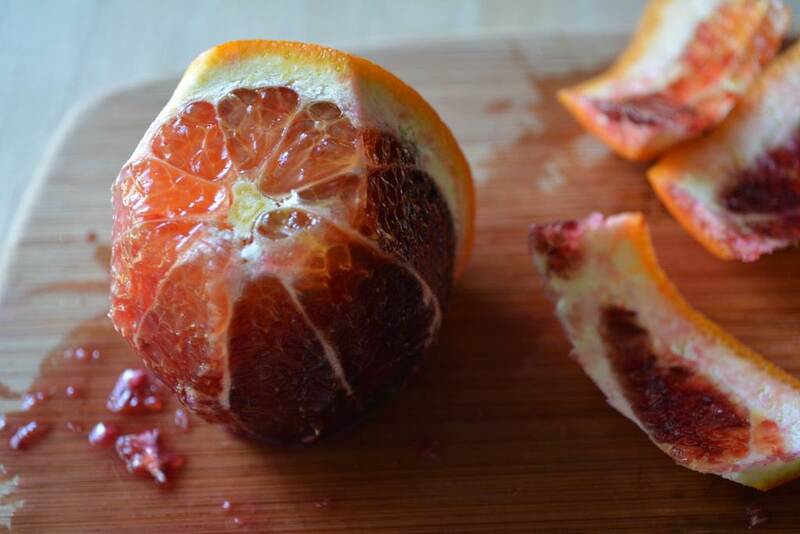 Cool slightly and then paint the blood orange slices with the glaze. Additional time required for baking the crust. That looks beautiful! I’m sure it tasted as good as it looks! Hello Sasha, this is a wonderful recipe. I took your week long pastry class at Tante Marie in July 2013. I had the best time and still bake items from our class! Hi Lisa! I remember you! So happy to see you here. Happy you like the tart! !